I’ve got a number of upcoming performances beginning this Friday, June 21, 2013 all the way through Monday, June 24, 2013. If you’re in western North Carolina and are looking for some live music to listen to, please consider coming out to any (or all!) of these shows. 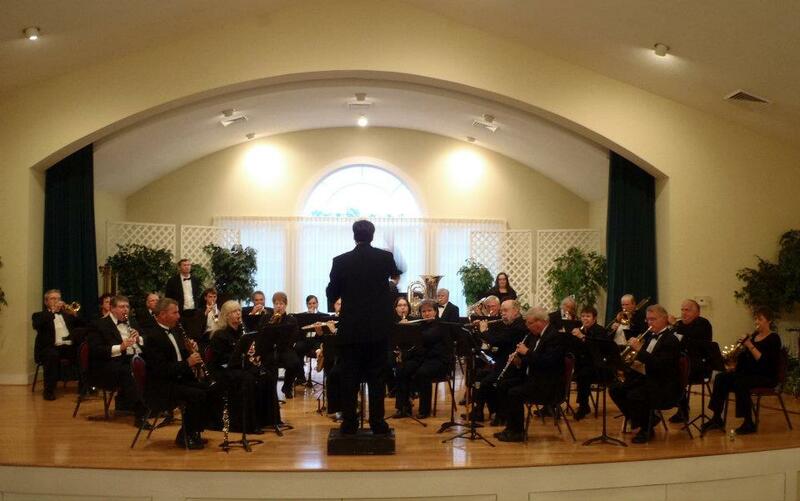 Friday, June 21, 2013 – Asheville Jazz Orchestra at the White Horse Black Mountain. The first of two sets starts at 8 PM. I’m expecting some swing dancers for this show, so I’m planning on programming some very danceable tunes, but we also play a variety of big band music, including some originals of mine. There’s a $15 cover charge. 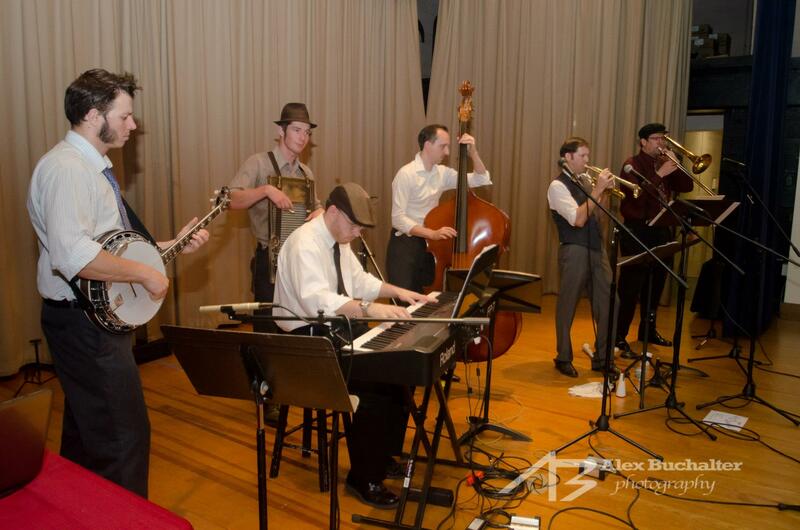 Saturday, June 22, 2013 – Asheville Jazz Orchestra again, this time at Highland Brewing Company. We’ll be playing from 6-8 PM and if the weather holds up we’ll be playing on their very nice outdoor stage. Highland Brewing Company makes some very tasty beer, so if you’re of age you can enjoy some adult beverages and hear this free show. Sunday, June 23, 2013 – I’ll be conducting the Land of the Sky Symphonic Band in a concert at St. Matthias Church. The concert starts at 3 PM and it’s free, although we’ll be collecting a good-will offering. The band will be performing a variety of music, including some music by Sousa, Blue Shades by Frank Tichelli, and music from The Cowboys by John Williams. We’ll even have a bell choir playing with us on David R. Gillingham’s No Shadow of Turning. 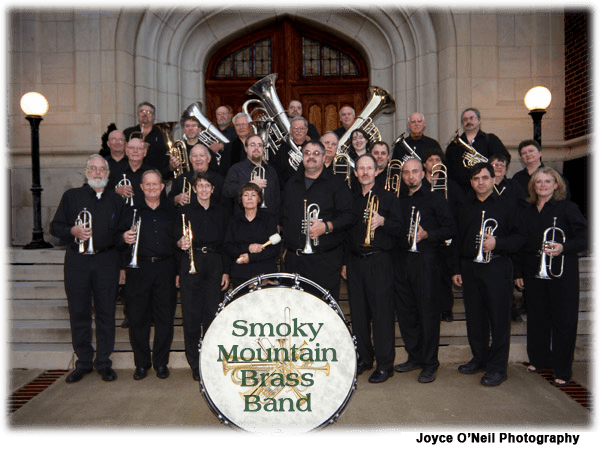 Monday, June 24, 2013 – I’ll be conducting again, but this time it’s the Smoky Mountain Brass Band at the Mars Hill College Summer Music Camp. While the performance is specifically for the campers, I think it should be open to the public as well. It will be at 7:30 at Moore Auditorium on campus. The brass band is performing a variety of music, including an arrangement of Seventy Six Trombones from The Music Man, Brass Metamorphosis by James Curnow, and La Danza by Rossini. If you get out to any of these shows be sure to say hello! Buzzing exercises and phrases on the mouthpiece alone is a very common tool and most brass teachers advocate it. I’ve used it myself for a long time both in my teaching and my own practice, but I’ve been relying on it less and less over the years. Influenced in a large part by the ideas of Donald Reinhardt, as taught to me mainly through Doug Elliott, I’ve pretty much eliminated its use in my own practice and tend to avoid recommending it to students in most cases now. That said, this viewpoint is in the minority and there are some situations where I sometimes find myself having a student buzz on the mouthpiece for a quick correction or boost in confidence. While different teachers will instruct mouthpiece buzzing differently, I think it’s useful to think a bit about what it seems to be doing for a brass musician’s playing, what are the benefits and what are the potential drawbacks to its practice. In working out some of these pros and cons it may be possible to avoid some of the issues that it may cause or find alternative exercises, depending on whether you choose to mouthpiece buzz or not. One of my teachers, John Seidel, taught me to use mouthpiece buzzing in a way where he would have me play a legato phrase or three, such as on a Rochut etude, buzz the passage on the mouthpiece (using no tongue except for initial attacks right after a breath), and then immediately pop the mouthpiece back on the instrument and play the same phrases again. Almost always I would get a feeling of relaxed playing and the tone would sound more focused and resonant. After playing a bit the improvement tended to disappear and I’d want to mouthpiece buzz again to recapture the sensation. I’ve used this same exercise with many students over the years and found that most players get similar results to this. Some of the key points in this exercise seem to be that you must buzz without using the tongue except for initial attacks after the breaths and you must play on the instrument immediately after buzzing on the mouthpiece. What causes this noticeable difference and why does it seem to disappear for many players after playing a bit? I recall John saying that over the years he found little difference after mouthpiece buzzing because he felt that the habits that mouthpiece buzzing encouraged were already established in his regular playing. What are those habits? I believe that mouthpiece buzzing encourages a player’s ear, embouchure, and breathing to all work together in order to buzz accurately on pitch. 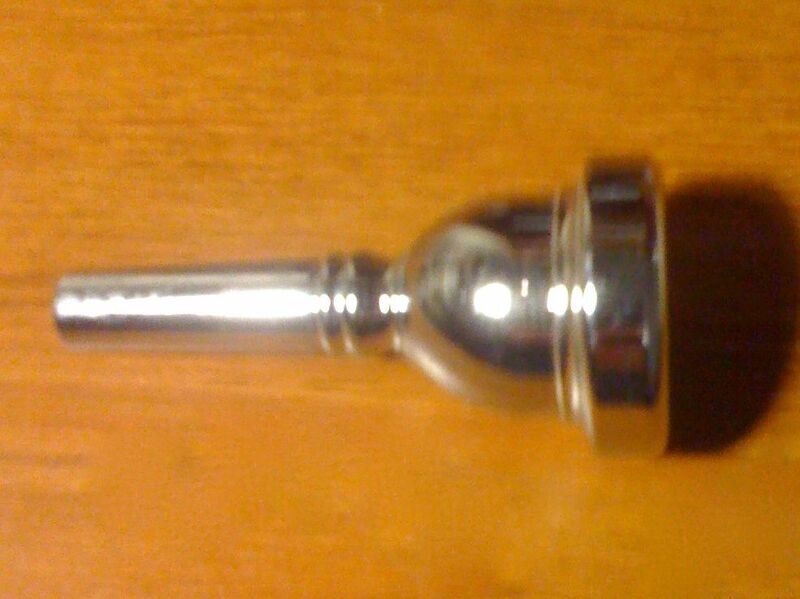 Mouthpiece buzzing is simply different from playing the instrument. If it were very similar then there would really be no point in practicing it as you might as well be playing your instrument. One of the differences is that you must focus your embouchure at the specific pitch you’re buzzing, while playing your instrument you can be a little off with the lip compression and let the overtone series slot the pitch for you. There’s also less air resistance and so you end up having to use your air more efficiently and take a larger inhalation in order to make longer phrases that would be easier on the instrument. It also requires you to really know the sound of the intervals and “hear” the pitches in your head so you can buzz the correct notes. On the other hand, what sort of drawbacks are there from buzzing on the mouthpiece? Oddly enough, I think the reason why people find benefits from buzzing (because it’s different from playing the instrument) is also what causes the drawbacks. Getting good at buzzing in the mouthpiece is simply different from playing on the instrument and what works well for buzzing is not necessarily great for consistent playing. Buzzing on the mouthpiece a lot seems to end up with an embouchure formation that is too loose and open in general compared to playing on the instrument. You’re also not training yourself to adjust to the overtone series correctly (keep in mind that a mouthpiece also has an overtone series, it’s just very high and different from the instrument). In particular, there are areas of “turbulence” in buzzing the mouthpiece alone that sometimes players have difficulties getting around and they sometimes resort to contorting their embouchure formation or otherwise doing something they should be doing when playing their instrument. So over the years I’ve been moving away from practicing and teaching mouthpiece buzzing and instead using other exercises to work the same thing. For practicing good breath control I like to use breathing exercises from the Breathing Gym instead. For working on focusing the embouchure correctly I practice and teaching things using the instrument instead (this can be different for each individual player and is hard to generalize here). Ear training is easily practiced by singing instead of mouthpiece buzzing. I will say, however, that one area where I still think mouthpiece buzzing has some value over other exercises is when working with beginners. Players who haven’t been playing for very long can benefit from learning how to buzz on the mouthpiece because it helps them work towards a good embouchure and eliminates things like fingerings or slide positions and tonguing so they can concentrate on keeping their mouth corners firm, etc. That said, I think that mouthpiece buzzing can be easily overdone and care should be taken with beginners to not rely on it too much. What do you think? Do you practice buzzing on the mouthpiece and/or teach students buzzing? Why do you think it’s beneficial or not? What do you do to maximize the results or avoid drawbacks? Hans Boschma, who created the site on http://www.embouchure.nl/ (in Dutch, so you’ll need to rely on translation software to read it if you don’t speak Dutch) emailed me a Prezi presentation for his Embouchure Reminder poster that I’d like to share with you. It’s interesting, although as a non-Dutch speaker I’m guessing that a lot of his ideas are getting lost in translation. In reading through it carefully I’ve found some things that seem to be misleading or maybe factually inaccurate. Take a look through his presentation first and then let me know if you think the below comments to Hans from me are accurate or if maybe I’m misunderstanding his ideas (or maybe I’m just plain wrong). Links in my comments go to other posts in my blog that go into more details about what I’m commenting on specifically if anyone wants to see more about my evidence and/or logic on why I feel a particular way. 1. I’m assuming that the 3rd slide (titled ” Interpretation of Stroboscopy”) refers to the diagrams on the prior slide. If so, you seem to be implying that the position of the mouthpiece on the lips is changed for different registers. I found that the majority of fine brass players do not change the position of the mouthpiece on the lips for different registers and personally prefer to teach my students to keep their placement consistent throughout their entire range. 2. On the first slide titled “B Continuation Normal Embouchure” you wrote, “The lower you play the higher the mouthpiece will shift and reverse.” This again give the erroneous impression that the mouthpiece is shifting to a new position on the lips, whereas what actually happens is that the mouthpiece and lips together will slide along the teeth and gums. The mouthpiece/lips shift to a new position in relation to the teeth and gums. Also, some players will do this in the opposite direction, so some push the mouthpiece and lips together up to ascend while others pull down to ascend. My preferred term for this phenomenon is “embouchure motion.” More on this in a moment. 3. On the same slide you mention using a “pivot.” While your use of this term is consistent with how most other brass players use the word “pivot,” you may want to be aware that the author that coined this term, Donald Reinhardt, defined a pivot as the sliding of the mouthpiece and lips together as a single unit up and down along the teeth and gums. This is why I prefer to use the term “embouchure motion” to describe this, as it is less likely to be confused. Also, you seem to be implying that the angle of the instrument is what determines the air stream direction of the embouchure. This is not accurate. The ratio of upper to lower lip inside the mouthpiece is what causes an embouchure to be upstream or downstream, not horn angle. If a player places the mouthpiece so there is more upper lip inside the cup, the embouchure will be downstream, even if the horn angle is straight out. Likewise, players who place with more lower lip inside have an upstream embouchure, even if the horn angle is tilted down. As far as “straight stream” goes, one lip or another should predominate inside the mouthpiece and the air will be either upstream or downstream. I’ve never observed a player blow straight into the shank without having serious playing issues, although the lower a player plays the closer towards blowing straight the air stream will go. 4. It’s hard to interpret what you say in the second slide titled “B Continuation of Normal Embouchure” without being able to look at the diagrams you seem to be referring to, but I’m confused about a couple of points you mention. First, although you are calling these characteristics “normal” you are also commenting that these normal embouchures are characterized by mouthpieces that are either “too large” or “too small.” You also mention some of these as shifting happens “mostly upwards” or such, but don’t comment on whether this shifting (I assume you’re referring to what I prefer to call the embouchure motion) happens while ascending or descending, which is confusing. In B6 you are calling blowing straight down the shank as normal, which really seems to only be accompanied by players with problems. Again, properly functioning embouchures really appear to either be upstream or downstream, a principle that you can see for yourself if you use a transparent mouthpiece to look at brass embouchures. In B8 you comment on the lip thickness as a determining characteristic of downstream embouchures. In my dissertation research the statistical analysis of lip thickness showed no significant correlation to embouchure type, so I don’t think that this statement can be considered accurate. 5. I’m not certain how to interpret your diagrams of “Embouchure Deviations” and the descriptions you use without more information. For example, you show number 9 of a split tooth and comment that there is some “rustling and hiss” in the sound. There are many fine brass players with significant gaps in their teeth. Two that I can think of off the top of my head are Jon Faddis and Dave Steinmeyer, both who have very focused sounds that I wouldn’t describe as having any hiss in them. I think it’s more important for a player with features like this to learn to work with their tooth structure and it’s definitely possible for players without gaps in their teeth to have some hiss in their sound. It seems to me there must be other factors at work producing this sound, rather than the teeth. You also show one player with an off-center aperture and comment that this results in a “loss of power.” I think if you observe many fine brass players using a transparent mouthpiece you’ll see that off-center apertures are more common than you seem to be implying here and they aren’t really accompanied by a weaker embouchure. Similar to the gapped teeth, many players without an off-center aperture have problems with a loss of power and manny players with an off-center aperture have very strong embouchures. It would appear that these issues are caused by something different, and probably such symptoms are caused by enough different things that it’s not so easy to encapsulate into such a simple cause and effect relationship as you appear to be implying in this presentation. 6. On the first slide titled “D Embouchure Deviations 2” you comment that round teeth arch cause problems. Again, this is not something I’ve ever noticed, but I do agree that your teeth structure are important considerations for building a good embouchure. Much like I commented above, I feel what players who are having issues related to their teeth have to do is work out how to work with those characteristics. This sometimes means placing the mouthpiece very high, very low, an/or off to one side of the lips. Sometimes players without any easily observable anatomical characteristics play better with atypical mouthpiece placements as well, so I’m not certain that there’s a direct cause and effect relationship here either. 7. On your slide entitle “F: Low Tones/Low Play” you mention that the jaw must come forward and the horn tilted up. This is indeed how many players to get into their low register, but I think this is too simplistic in many ways. For example, some players will descend more easily by bringing their horn angle slightly down instead of up. Secondly, I personally don’t advocate doing something in the embouchure, like dropping the jaw and/or bringing it forward to descend, unless it works the opposite way to descend. Many (perhaps most) players will bring their jaw slightly forward to ascend and slightly back to descend. However, at a certain point in their low range (usually extreme low range) they will reverse this by bringing their jaw suddenly forward a great deal. Personally, I think it’s best to avoid this practice as much as possible as this seems to be accompanied by a change in timbre and potentially can cause issues down the road if this practice starts to work it’s way into the middle and upper register. Working with the embouchure motion, jaw position, and horn angle in the middle and upper register can help these players learn how these minute changes work, which then can help them open up the low register without resorting to horn angle and jaw position change you’re advocating here. I should mention, however, that my ideas here are probably not the majority opinion, but I do think the logic that this is based on is sound and have had success helping students learn how to descend in this way. 8. In your next slide you discuss “Non Pivot.” If you define pivot the way Reinhardt did (what I prefer to call the embouchure motion), then all players will pivot to some degree or another. If you’re defining it as a horn angle change, then not all players will tilt their horn to change registers. Of those players who don’t, some will possibly play better if they do learn how to adapt their horn angle according to the register, as long as they learn how to make this work with their anatomy. This is something that is personal to the individual player and hard to generalize or relate to any specific embouchure or physical characteristics. 9. Almost all of your diagrams show a very large mouthpiece over the vermillion (red) of the lips and most seem to be perfectly centered. While a tubist’s embouchure might actually look like this, I’m not certain that this makes for the best or most accurate depiction of how mouthpiece placements work with brass embouchures. It implies that a centered placement is best (not typically true, one lip or another must predominate, sometimes to a large degree). There’s a lot more variation in how brass embouchures work and I’m not convinced that your diagrams make for the best way to present what works and what doesn’t work. While it’s very difficult to capture good photographs and video of players playing into a transparent mouthpiece, in my opinion this is the best way to go and really the only way to accurately document what you will actually see. Drawing diagrams may help present information, but they can also be misleading and I’ve found that many brass authors who rely on drawing diagrams to describe what goes on inside the mouthpiece are frequently wrong and simply imagining what they think should be happening rather than taking the effort to actually look. Philip Farkas is one example, in his book “The Art of Brass Playing” he described air stream direction completely wrong, but then later discovered upstream and downstream embouchures and published these photos in “A Photographic Study of 40 Virtuosi Horn Players’ Embouchures.” Many of your diagrams do match what I’ve observed using transparent mouthpieces, but some do not so I can’t tell how much actual study of functioning embouchures you’ve done to arrive at those depictions. Criticism aside, there’s a lot in his presentation that I agree with. More importantly, I like that Hans is interested in sharing his information and taking a scientific approach to studying the embouchure, rather than the “arm chair” speculation that passes for embouchure analysis by many brass players and teachers. I think if more people would toss around ideas like this and make it easy for discussion and debate that the field as a whole would move forward more quickly than it tends to. I will be playing in Rochester, NY this weekend, June 8-9, 2013 at Stompology with the Low-Down Sires. I’ll be playing in the evenings, but have time during the day for embouchure lessons if anyone who is looking for help is in the area. Drop me an email via my contact form.